Photo: Courtesy of Cooking With Cakes. Making a dinner in 10 minutes that doesn’t come from your freezer is pretty impressive, right? Not, like, I-consumed-13-Bloody-Marys-in-two-hours impressive, but you get my drift. Obviously, the time factor is a major draw here, but the flavors are completely killer, too. I made this sweet & spicy sauce so that it appeals to everyone, but feel free to add a little bit more Sriracha to meet your own tastes. Also, feel free to pair this with rice, quinoa, noodles, a veggie medley, whatever. Lightly salt and pepper shrimp on both sides. In large bowl whisk together pineapple juice, Sriracha, ketchup, honey, and soy sauce, combining thoroughly. Add shrimp to sauce and toss well to coat. 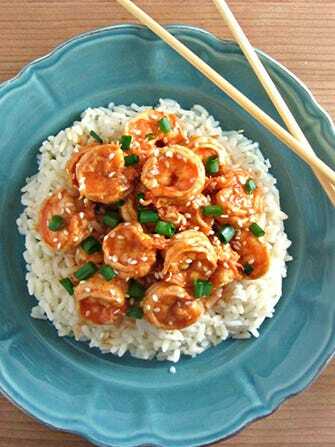 Heat large skillet with sesame oil over medium flame, then add in shrimp. Sauté on either side for three minutes until shrimp is pink and curled into a "c" and remove from heat. 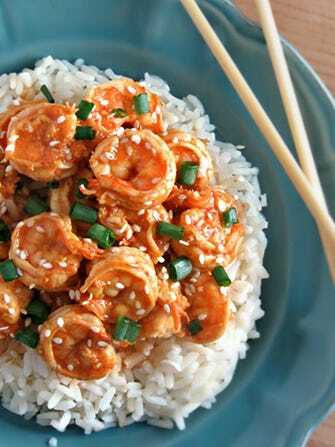 Immediately plate and serve, pairing with rice and garnishing with scallions and sesame seeds, if desired. 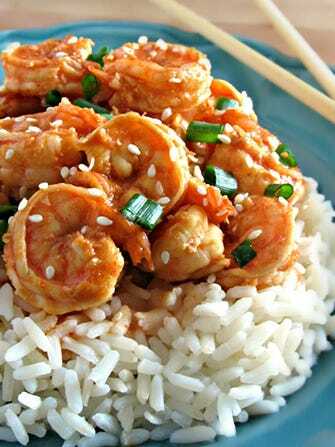 As a note, the shrimp can be marinated for up to eight hours. Feel free to do this in the morning, then cook after work.